Every time a document is printed or photocopied, potential efficiencies are lost and unnecessary costs may be incurred. Paper documents are not searchable or sortable. They can become easily disorganized. 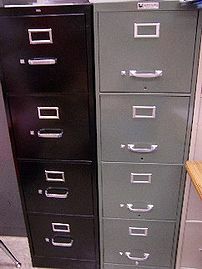 They require physical storage space in binders, boxes, and cabinets. They are expensive to ship and to archive. Every duplicate set costs as much to copy as the first set, and every time documents are disassembled for copying their condition is degraded. When you put it that way, why aren’t more offices going paperless? Adding up these costs, you might be surprised how inexpensive a computer upgrade, a server, and a scanner will actually be. I was leaving an office the other day and there was a little fire department activity in the lot behind it. My first thought – a spark to the roof, and all those documents… Sure, the alarm would go off, and the fire department was already there. But that would do nothing to save the documents in the cardboard storage boxes in the attic, or the non fire-retardant filing cabinets on the floor below, or the non-fire retardant filing cabinets in the main floor. I’ve seen an apartment complex fire, and it can destroy a lot, in seconds. There would be no way to save even a portion. But a server with a removable drive? And if that drive was backed-up weekly and that backup kept off-site (which is a good idea no matter what your backup plan is.) The computers would be toast, but insured – and who doesn’t like nice new shiny office stuff?